Welcome to the "From Mild to Wild" Suspension section. Most users will find the engine/power section more interesting, but this section is for those with a little different view of what an FC3S can do. Info will include everything from basic street upgrades to possibly turning the car into a pro-race chassis! Enjoy! Stage I starts with basic bolt-on's that replace stock components that are typically worn to begin with. Shocks/struts (we will call them "dampers" from now on) are the big replacement here; rear shocks that are still original are probably blown and leaking by now. Rear shocks actually contribute to most of the handling! Stage I+ was added just because the costs of tires is 1) usually not associated with suspensions (but it is! ), and 2) cost prohibitive due to usually costing several hundred dollars; Stage I mods were designed for relaively "cheap" upgrades, especially for those on a budget. Now that we have a solid suspension foundation to work with, Stage II goes on to complement the damper and spring combo by reducing body roll and stiffening the chassis. You could combine Stage I and Stage II together, as most people do. 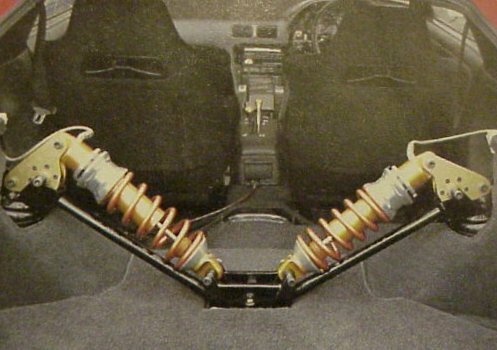 Stage I and Stage II cover the typical (bolt-on) suspension mods for most street cars. Stage II+ is just an extension of Stage II, as it only covers the DTSS eliminator bushings. It can be argued that this mod can be places elsewhere, but we've decided to place it here. : This has been a recent modification that has been written by Mike Kojima in Sport Compact Car magazine. By injecting expanding urethane foam into exposed sub-frame areas, the entire chassis can be stiffened significantly. At the very least, these expanding foams will decrease road noise traveling into the interior. Stage III covers bolt-on's that allow for greater suspension and alignment tuning. : Adding a bit of negative camber to the front tires can add greatly to increased cornering loads. The FC3S typically cannot induce serious negative camber (2° or more), so camber plates are used to dial-in more. In addition to the extra adjustment, the camber plates also eliminates the stock rubber upper strut mounts that flex under load. : This is basically the same as the front camber plate but with no adjustment. The stock rear upper strut mount is a very thin piece of steel; this piece has been known to break and bend under heavy cornering loads!. : This is taking springs one step further. We are only aware of Ground Control retrofit coilover systems, so this info is mainly applied to their components. With the addition of these coilovers, you have the option of (literally) hundreds of combination of spring rates; Ground Control offers Eibach ERC race, linear springs. Threaded collars allow for ride-height adjustability, but this should be done with weight scales to fine-tune chassis weight balance. : This bar offers no serious performance gain, except to adjust out excessive negative camber in the rear tires. Dropping the rear suspension significantly (1" or more) will induce serious negative camber in the rear tires. Too much negative camber affects tire contact patch of the rear tires. A non-optimal tire contact patch of the rear tires degrades acceleration. It looks like Stage IV is the border between street and race. The addition of a roll bar or cage adds greatly to stiffening the chassis, but it gets to be borderline practical for everyday street use. Stage V goes into a race chassis. Components get very expensive as options are narrowed to very specialized vendors. : Suspension tuning takes a step-up in sophistication. Dampers need to be double-adjustable to allow for indenpendent tuning of compression and rebound characteristics. Specialized shocks can be as cheap as a set of custom, converted Koni Race units to damper brands such as JRZ, Moton, and Penske. These units usually are integrated with their own adjustable ride-height and spring systems, so this upgrade changes both the dampers and springs at the same time. : A splined (bar with lever-arm) front anti-sway bar allows for more flexible tuning By changing the diameter thickness of the center, splined bar, the roll resistance characteristics change. Tri-point offers such a bar. : At this stage, all bushings should be converted to Delrin to allow the suspenions components to work to maximum effectiveness. Mazda Motorsports offers Delrin bushings. Stage V+ is an addendum to Stage V on damper design. : Remote reserviors allow for cooler running dampers by increasing fluid capacity of the dampers. Shock builders will also include extra dimensions in damper tuning be controlling compression and rebound on the remote reserviors themselves. Most high-end shock brands already include remote reserviors on their dampers - this is why this is more of an addendum to Stage V.
Stage VI goes into the extreme suspension mods that require good fabrication skills to pull off. This goes into the most extreme suspension set-up's that are possible on the FC3S chassis. Only a very few FC3S owners would be fortunate enough to be able to pull such suspension mods off, as we are talking about THOUSANDS of dollars here! : A cantilever suspension suspension system removes the damper and springs away from the wheel hubs and runs them remotely via a bell-crank system. By moving the damper and springs, unsprung weight is greatly reduced - the wheels and tires react a lot quicker to changing road conditions. : With a lot of money and resources, a double-wishbone retrofit would be the pinnacle of suspension systems. The double-wishbone allows for a more refined suspension that are engineered into the top race car chassis'!